Simon Birmingham with students at Cecil Andrews College. Students in Perth’s south-eastern suburbs are the first in Western Australia to take part in an innovative model of school and industry collaboration that will give them real-world skills in science, technology, engineering and mathematics (STEM). 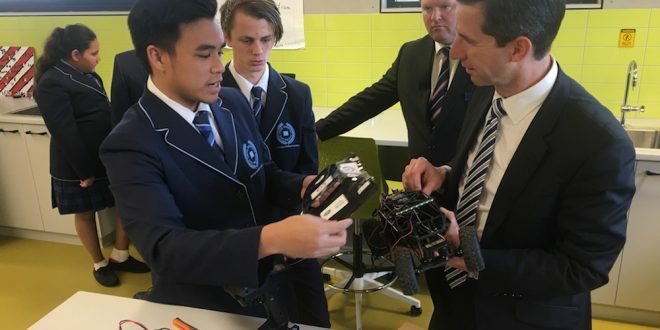 Minister for education and training, Simon Birmingham, visited the Southern Perth Pathways in Technology (P-TECH) pilot at Cecil Andrews College in Seville Grove. “By forging partnerships between local employers and schools, we’re helping the next generation build the vital skills they need for the jobs of the future,” Minister Birmingham said. “This is the first P-TECH pilot in WA and it’s part of our national expansion of the program to 14 sites across the country where employers can work alongside schools in preparing young people for success in further study and work. “The $4.6 million expansion of the pilot will see students build connections between what they are learning in their classrooms and practical applications in the workplace. Secondary students involved in the pilot will be on an industry-supported pathway to complete their Western Australian Certificate of Education and then continue their studies to gain a STEM-related diploma, advanced diploma or degree. “I welcome the involvement of Austal, Civmec, Datacom and Thales as industry partners particularly as Western Australia’s defence workforce expands, as well as Deloitte, HP, South Metropolitan TAFE and the Western Australian Department of Education who are also supporting this initiative,” Minister Birmingham said. “This is also an opportunity for industry to become mentors for the next generation of workers, who will need modern skills in order to succeed in the decades ahead. Through P-TECH, industry partners can assist schools with skills mapping, provide employees as program mentors, offer workplace visits, provide speakers to address students and engage in authentic learning experiences with students, both at school and in the workplace. The government has so far announced seven of the 12 additional P-TECH pilot sites, with the remaining five sites to be determined in consultation with state and territory governments, non-government school authorities and industry.